Red Clay Drawing Retreats are weekend-long retreats held monthly throughout the winter and spring at Red Clay Farm. If you are interested, please join Red Clay Drawing on facebook. You can email redclaydrawing@gmail.com if you have questions or to register. The basic principal of the workshops is focused on developing the skill of life drawing through 10 sessions held throughout the weekend. Participants model for each other allowing us to offer affordable rates. 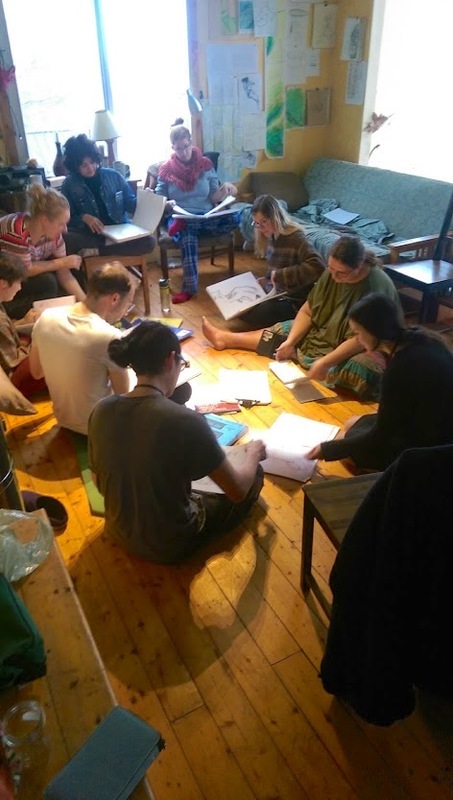 Red Clay Drawing Retreats were started in 2013, and were originally week-long sessions, and have transformed into a recurring weekend event, in which the group works together to provide the materials, modelling, transportation, food and meal preparation. The February 22 drawing retreat will be a mixed life drawing and sculpture (clay) session. To facilitate this Saturday on February 23rsessions will be longer poses to accommodate sculpture. Not exactly. We have a shared meal system that has served us well. Each participant helps to create one meal over the course of the retreat. Bringing the food they will need, doing the cooking, and cleaning up afterwards.